First things first: when I uploaded this drawing I laughed because the addition looks BLACK. And we are using a black brick, but it’s still not THAT black. When you see the drawing at full scale, the new work is rendered in a darker line weight than the existing building – which is why the old house looks gray and the new looks like an ink blot at this scale. Click to enlarge it and it’s better. The top drawing shows a cross section through our lot – if you imagine slicing it along the narrow walkway between our house and our neighbor-to-the-east’s house and then you look west. It shows the east elevation of the addition and the new enclosed balconies. Because the garage extends all the way to the east property line, this section cuts through the building, so you can see the stair to the upper apartment, and also the landing and ship’s ladder stair to the roof hatch, which will access the roof deck / roof garden above. 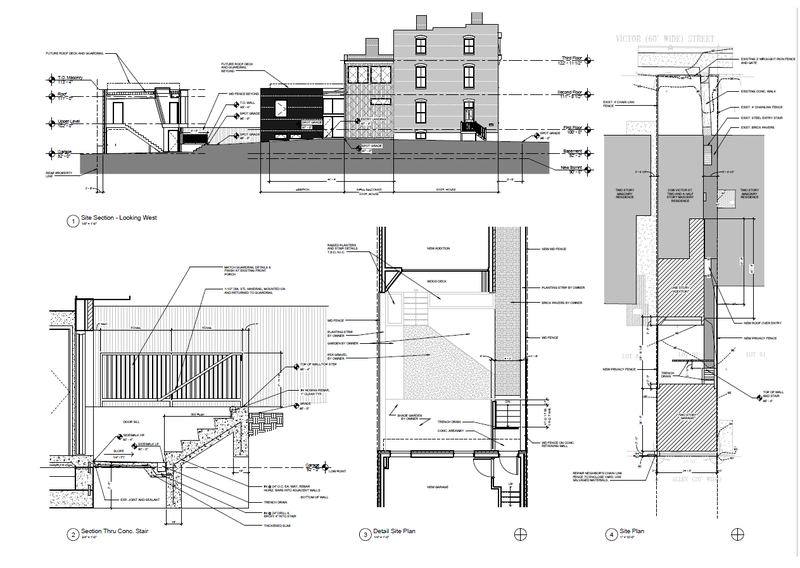 The lower left drawing shows the stair to the garage entry door. Remember that the alley level is about 4′ below our yard level, so we have to go down to get into the garage. We probably tried fourteen different configurations of stairs – interior, exterior, turned, straight, entering at a landing, everything. Few worked with head clearances and the site conditions, not to mention the flexibility of uses for that upper apartment. If we ever rented out the space, the tenants or guests will have to walk through our yard to access the carriage house, but having a door on the alley side didn’t make any sense if we want to use the space ourselves or have family stay there. And I wouldn’t feel comfortable having a tenant park on the street and then walk down the alley to their front door. So this is where we landed! The layout of the yard space is tentative – we’ll design that space more as the project progresses. You can see that the walls of the addition extend out beyond the folding glass wall, creating a small deck area where the glass panels can fold and rest when open, and where we can put a few chairs or pillows out and enjoy the sun. We’ll have some sort of stair / planter arrangement that will help us minimize the need for railings. And then we want to have a small seating area on the ground, with planting beds around it. There will be a nice shade garden against the wall of the garage, and I’d love a hammock there. By having a large dining room with a wall that completely opens, I think the outdoor space will feel quite comfortable for entertaining, and also cozy enough for just the four of us to relax in on a daily basis. We’ll have to lay the salvaged bricks down again leading to the new garage stair. M wants to plant some fruit trees that have been trained to grow flat against that new east fence line. And the dashed diagonal lines along the enclosed balconies represents a cable system for growing green up the side of that portion of the house. It’s almost spring! Give me all the green!